When done right, breakfast is probably my favourite meal. We expect a nice cooked meal at night time. Breakfasts generally leave us less time for cooking. I have the luxury of not having had kids yet, which means that I have more time for cooking. Weekdays don’t leave you a lot of time. Often weekends get packed full with activities, leaving less time as well. So when you get the chance to make something nice for breakfast, I think it tastes all the better for it. It becomes special. It becomes decadent. And Saturday/Sunday morning is instantly taken to another level. This weekend breakfast recipe was inspired by a recipe in the CSIRO recipe book number 2 (I can’t help but give it my bunny spin, though). Given how good it tastes, it is surprisingly simple. I would pay good money for this in a cafe. I’ve made it a couple of times and it is the kind of versatile recipe that you can make different ways until the cows come home, so it should stay fresh. Use normal flour instead of wholemeal. Leave off the eggs/fry the egg instead. Serve raw spinach rather than wilted in garlic. Use ham, bacon, prosciutto or jamon instead of salmon. 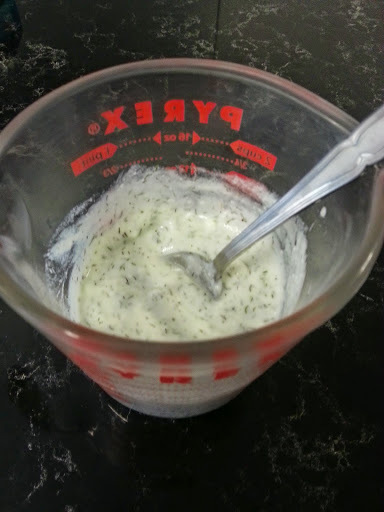 Use coriander (cilantro) or chives instead of dill in the yogurt sauce. Replace the yogurt sauce with a salsa and/or guacamole/sour cream/cream cheese topped with capers. If weekends mean that anything goes, replace the sauce with hollandaise – yum. Apparently if you don’t have buttermilk you can make it by mixing 1 tsp of lemon juice or vinegar into 1 cup of milk then leaving it for 5-10 minutes and stirring. I guess you could do this while chopping the veggies and getting everything else out and ready. Poach eggs, if desired. I have a machine that does it for me. 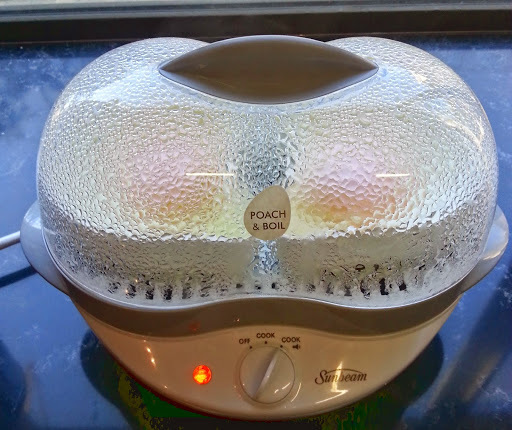 Otherwise use a silicone poacher floating in boiling water or cook them the traditional way. Sift flour into a mixing bowl, make a well. Pour egg mix into the well, stir until smooth. 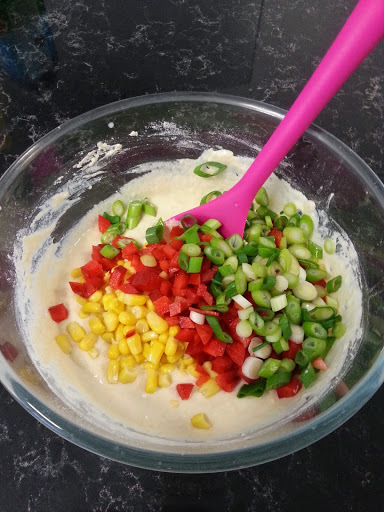 Add corn, capsicum, spring onion, parsley, fold through batter. Mix yogurt, lemon, dill in separate small bowl. Less pretty image, but it does taste good. Heat rice bran oil in a non stick frypan over medium heat. Drop portions of approx. 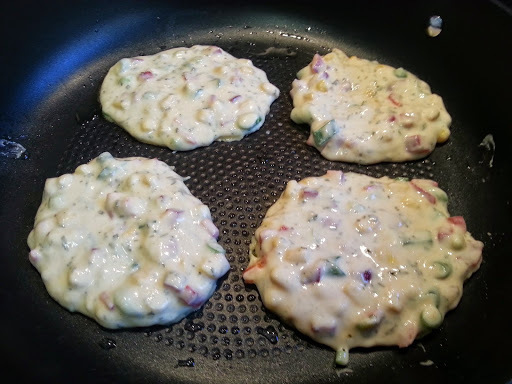 1/3 cup or 1/8th of mixture into the pan and cook for approximately 3 minutes. Turn and cook until set (approx 3 more minutes). I like them a little rustic and imperfectly shaped. Meanwhile, cook spinach and garlic in a frypan until wilted, or leave out this step if you are just using fresh spinach to simplify things. 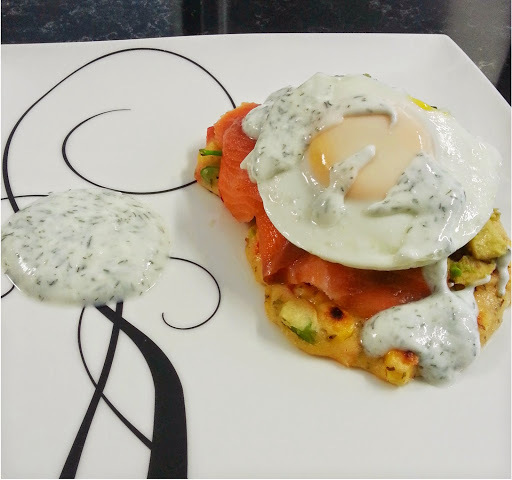 Serve 2 fritters per person, topped with avocado, spinach, salmon, sauce and egg (if used). This breakfast takes a bit of time but its well worth it if you enjoy cooking like I do. We played music and had fun taking our time cooking together while sipping coffee on a free Sunday morning. I pulled out my fancy apron which always makes cooking feel more fun – I cant explain why. We ate outside on the balcony and with a good mug of coffee ands felt content. This meal is a good size – I felt satisfied but not stuffed. 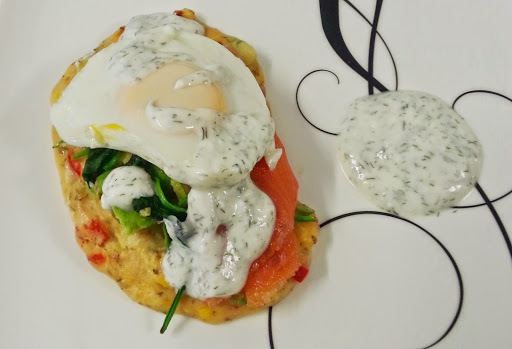 The flavours work well together – sweetness in the corn and capsicum, tartness in the sauce, the dill with the salmon, the soft flavour of of avocado…I think it all works well together. This meal would make a great breakfast treat to bring to your loved one as a surprise breakfast in bed on a tray with a nice glass of orange juice/tea/coffee. Just get up early, tell them to go back to sleep, then surprise them with this cafe-style treat and you will score loads of brownie points 😉 It would also be good to make for a few friends invited over for brunch. Leave off the salmon if anyone is vegetarian and it will still taste good. We put the remaining 4 pancakes in the fridge to reheat in the microwave on Monday morning. We had 2 nuked fritters topped with a slice of salmon and leftover sauce in bed with coffee and snuggles 🙂 A nice start to the working week. What is your favourite weekend at home breakfast?